As I describe in chapter three of Between Air and Electricity tuning forks are in some ways a kind of predecessor of microphones and loudspeakers. They can also be seen as a predated sine tone generator. 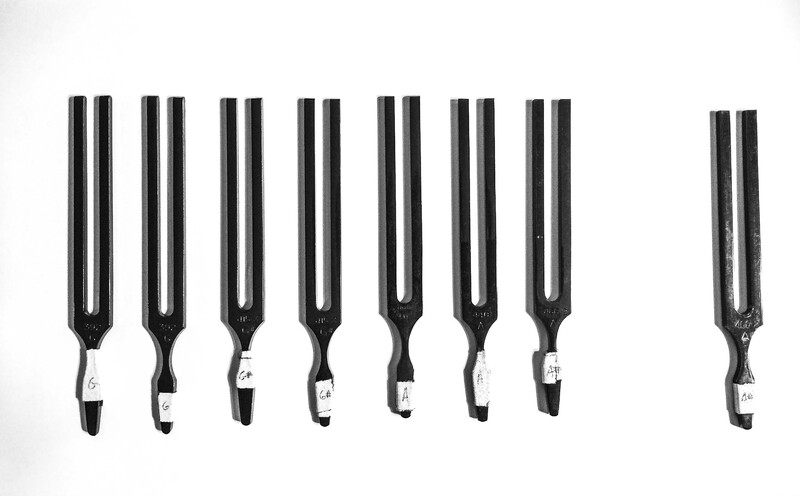 Tuning forks were extremely important for nineteenth-century acoustic research. A tonometer, for example, was a large set of tuning forks and used to define the frequency of other sounds. 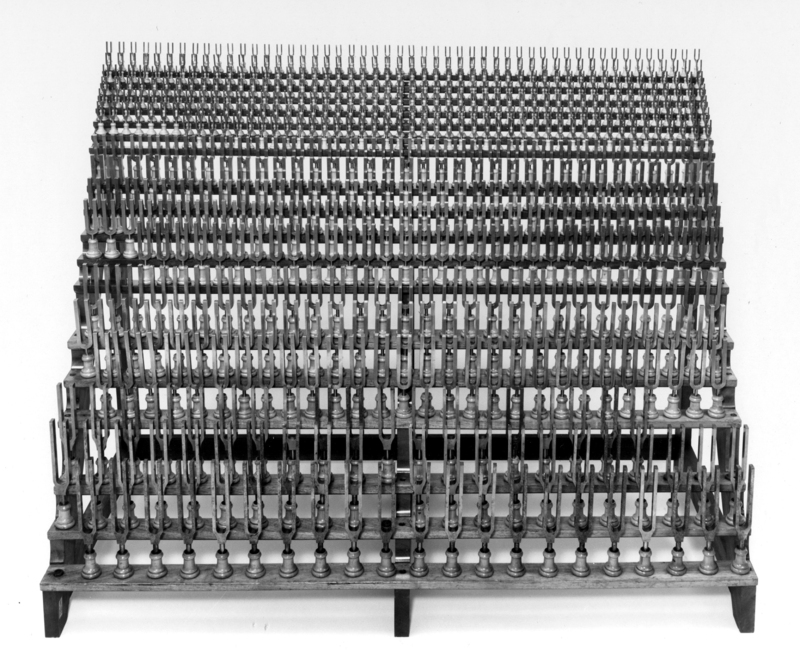 The one depicted above was made by Rudolph Koenig and contains 670 tuning forks from 16 to 4096 Hertz. It was exhibited during the Philadelphia Exposition of 1876 and was apparently regarded as “the most scientifically important instrument at the event” (Smithsonian National Museum of American History). 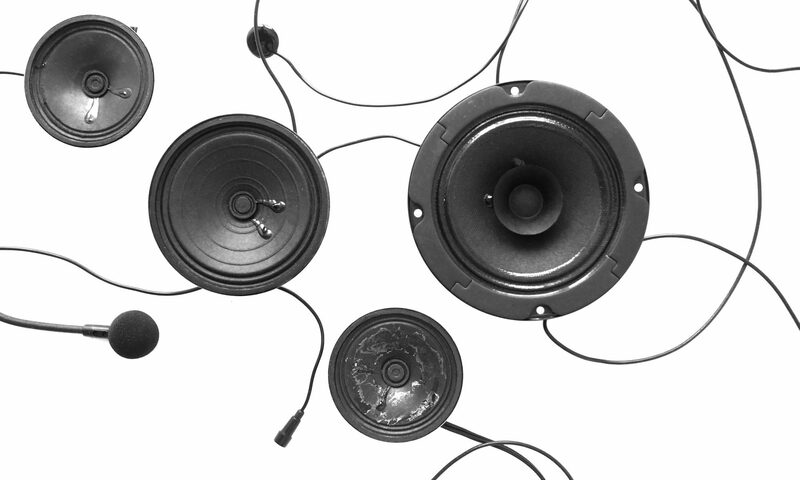 A weird relationship between the visual and audible aspects of sound production is characteristically of Apart. The biggest gesture—a tuning fork being hit to bring it into vibration—is nearly silent, whereas the sound being heard is caused by the small gestures of placing the tuning forks on the surface equipped with the contact microphone. 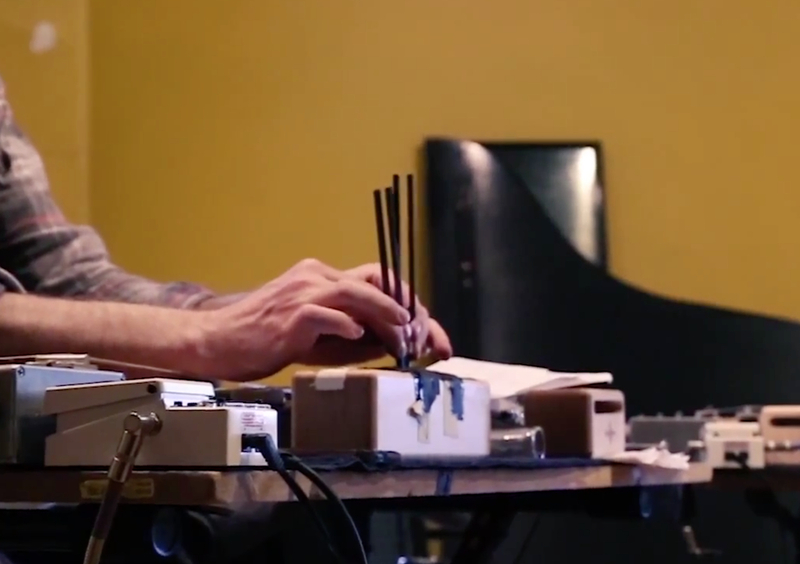 Sonically, a weird organ sound is the result, often emphasised by two percussionists playing the same pitch. The tuning fork resonances, slowly become softer and are then interrupted by a soft click of the tuning fork being hit to vibrate it again. At the end of each section in the score (see the score fragment below), Oscar asks all percussionists “to strike the fork(s) they require for the next bar simultaneously” and this should be done “as a grand gesture”. Three bars of the score of Apart by Oscar Bettison. The abbreviations R.P., I.P. and I.A. are all descriptions of rhythms for putting down the tuning forks on the cloth above the microphone: see also the explanation below. © copyright Boosey and Hawkes, Inc.
– R.P. is the abbreviation for Regular Pulsing and indicates the player should “chose a tempo and pulse the tuning fork(s) on the playing surface”. – I.P. is the abbreviation Irregular Pulsing and means the player must “Pulse the tuning fork(s) irregularly on the playing surface ending with a sustained note”. – I.A. 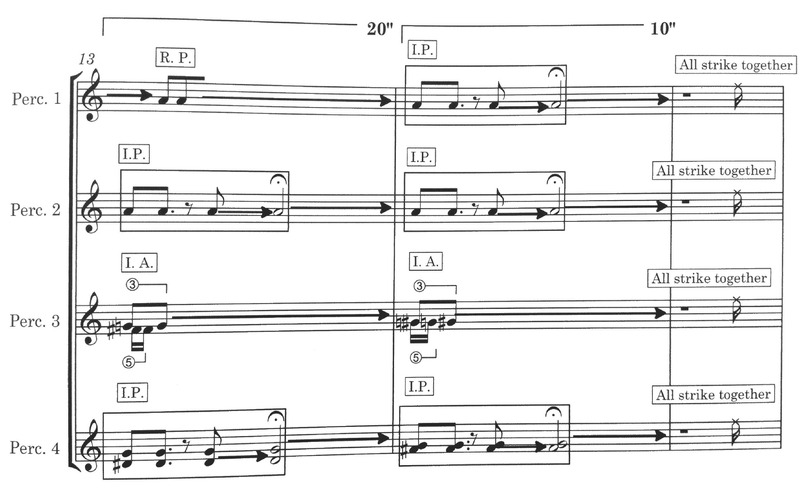 is the abbreviation for Irregular Alternation and means the percussionist should “Alternate two tuning forks in a polyrhythm”(from the performance instructions of the score of Apart by Oscar Bettison, Boosey and Hawkes).